Perhaps tomorrow's stars can be a guiding light. “Wait ‘til next year” isn’t a marketing slogan anyone wants to use in August. But with MLB’s 2019 schedule being released on Wednesday, it’s as good a one as the Mets have right now. Tomorrow’s stars: Start with Jeff McNeil, who is making a strong bid to secure a spot in the lineup next March 28 when the Mets open the season against the Nationals in D.C.
McNeil had a triple and a single in his first two at-bats in Wednesday night’s 5-3 win over the Giants. The 26-year-old Daniel Murphy wannabe had hits in a Mets rookie record eight consecutive at-bats before he grounded out to first in the fourth. McNeil, who could be the Opening Day 2019 second baseman, is batting .333 in his first 93 big-league at-bats. He looks “hitterish,” to use a phrase, and the Mets need more of that. Dominic Smith, who hasn’t looked hitterish enough, finally got a start at first base and hit a second-deck homer to right leading off the second. The Mets are in a weird place with their 23-year-old former first-round pick. 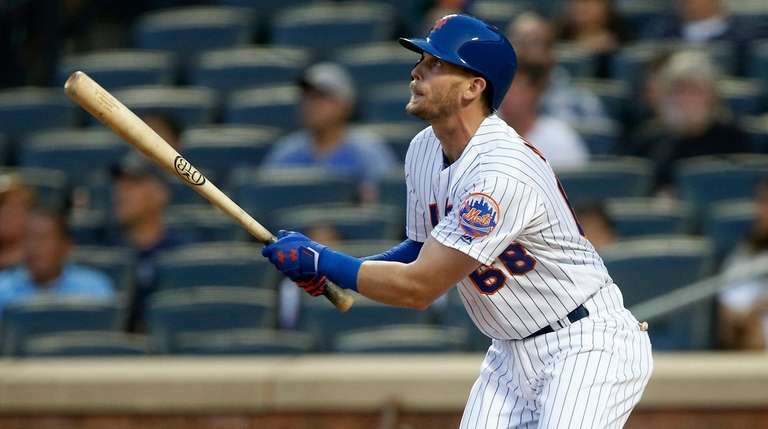 Smith hasn’t hit enough in Triple-A or the majors to earn an extended look and has played more outfield than first base even though the Mets are in desperate need of a . . . young, power-hitting first baseman. There’s something to be said for making Smith earn it. There’s also something to be said for not using Wilmer Flores or Jay Bruce (who should be activated from the disabled list on Friday) or anyone else other than Smith at first for the rest of the season. Of course, the Mets know who their Opening Day starting pitcher will be: Jacob deGrom. That’s assuming the general manager they haven’t hired yet to replace Sandy Alderson doesn’t trade the Cy Young Award candidate in the offseason. That general manager apparently will have to agree to keep Mickey Callaway if he wants the job. In a deliciously Metsian move, ownership apparently has decided the rookie manager will get to return for a second season before they know who his boss will be. Maybe Callaway will be a star of 2019 because he hasn’t been one in 2018. Callaway made his bones as the Indians pitching coach, and the Mets will host Cleveland next August as part of a dull-as-dishwater slate of interleague games vs. the AL Central. One of Callaway’s projects, Noah Syndergaard, allowed two runs (and no stolen bases on no attempts) in six innings to get the win on Wednesday. The Mets are concerned enough about Syndergaard’s penchant for giving up stolen bases that Callaway said it’s something he needs to work on in the offseason. (How do you work on your pickoff move in the offseason? Picking off your neighbor in the driveway?) Callaway said it’s something they’re emphasizing now to help Syndergaard refine his game. It’s necessary and difficult and may not work. So enjoy deGrom and Syndergaard and McNeil and Smith (and Bautista for some reason) before the Mets end the season at home against Miami on Sept. 30. The 2019 home opener is April 4 vs. the Nationals. No one really knows what the Mets will look like by then. Especially the Mets. That’s not a great slogan either, but it’ll have to do for now.